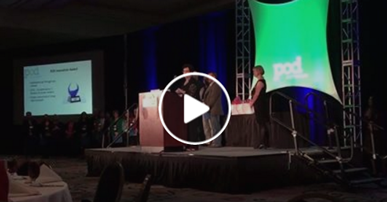 Video: Watch Michael Palmer from UVA’s Center for Teaching Excellence and Adarsh Char from FTA win the 2016 POD Innovation Award. Based closely on the University of Virginia’s internationally-recognized Course Design Institute, c3Design won a 2016 POD Innovation Award because it is a highly interactive online learning environment that guides instructors through the iterative, dynamic, and scholarly process of learning-focused course design. More than anything else, c3Design is about a process that helps instructors unlock new perspectives and possibilities. Several innovative features support this goal: a series of well-crafted knowledge checks, an automated syllabus template, a novel integration map, a syllabus rubric, a fully searchable syllabus database. As institutions of higher education continue to value, promote, and reward evidence-based practices of teaching and learning, c3Design shines as a core scholarly activity that is informed by research and reflection and which results in deep learning for all students. It is intended as a resource and community for scholars and practitioners that want advance teaching and learning through professional development. The initial step in each stage of c3Design involves introducing instructors to foundational ideas and concepts such as student motivation, backward integrated course design, and Fink’s Taxonomy of Significant Learning, which they will eventually use to develop their course while they learn how. Throughout c3Design, users encounter Knowledge Checks that allow them to test their understanding of key concepts. For example, after learning about motivation theories, users are asked to determine whether common teaching behaviors (e.g. allowing students to work in small groups on complex projects) increases or decreases motivation and what the causes is. Detailed explanations are provided after they submit each answer. 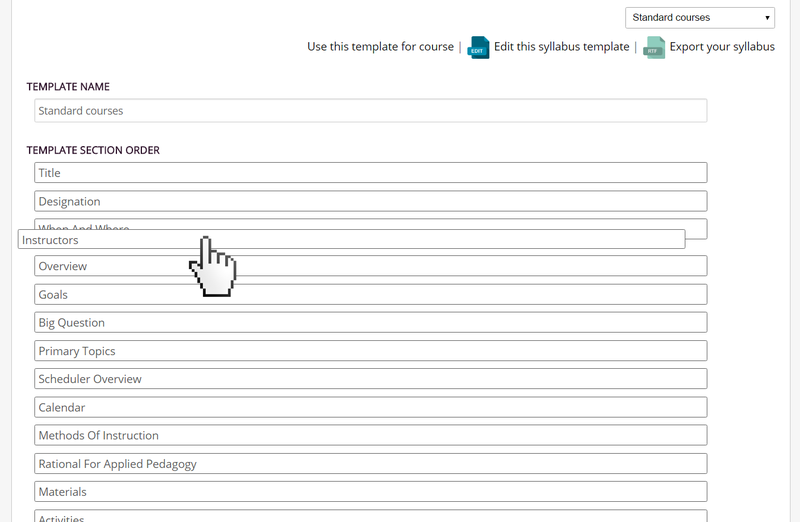 As instructors complete the various components of their syllabus, these are added automatically to a syllabus template. The template is quite flexible, can be modified to meet each instructor’s specific needs, and is easily exported and shared. This unique and powerful tool gives instructors instantaneous feedback on the quality of their design by analyzing it behind-the-scenes and displaying a variety of graphical representations of their work-in-progress. 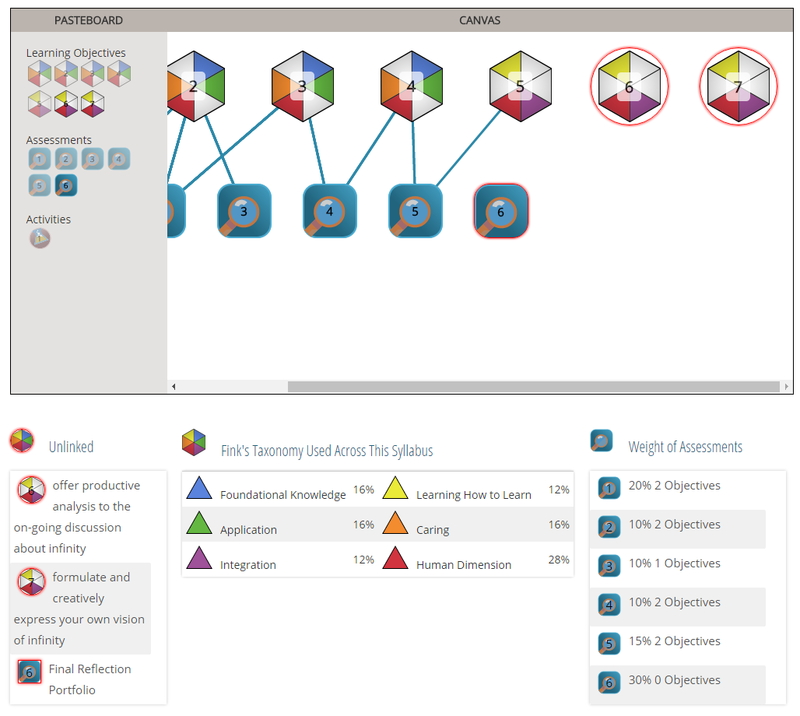 For example, based on how the instructor maps their learning objectives onto Fink’s Taxonomy, the dashboard reports the relative percentages each taxonomic domain contributes to the overall learning objectives (e.g. foundational knowledge might account for 40% of the user’s learning objectives). When used iteratively, the Integration Map helps instructors quickly refine their design to better reflect their intentions. 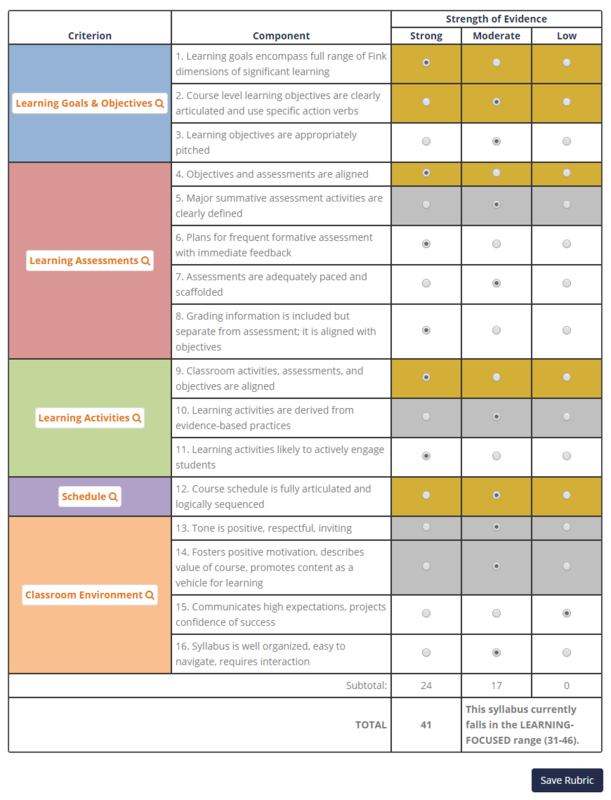 This award-winning tool helps instructors measure the focus of their syllabus (content vs learning) and provides them with formative feedback on how to continue to shift it further toward a learning focus. 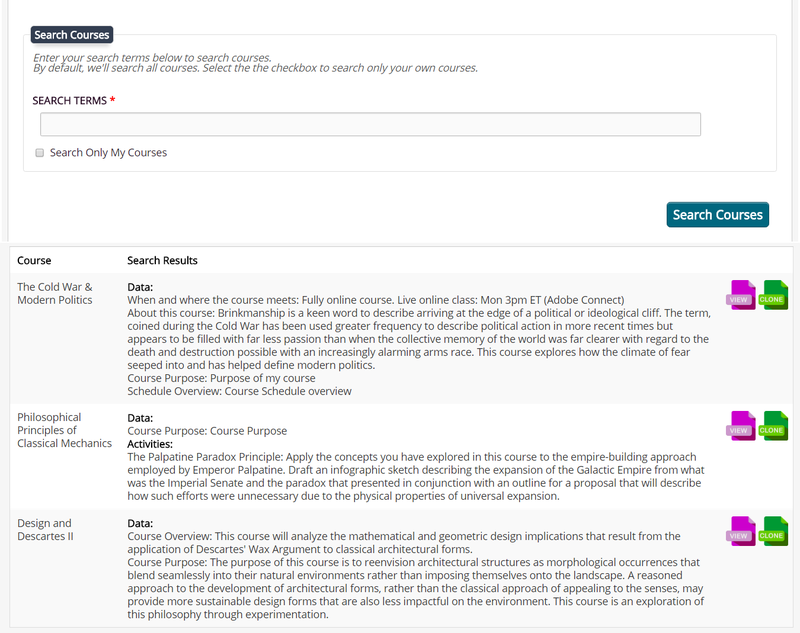 This ever-expanding, fully searchable, moderated database only includes syllabi made public by instructors that have a learning-focus as described by our Syllabus Rubric. When beginning the design of a new course, instructors can search for similar course offerings and import those designs directly into their work space rather than having to start from scratch.